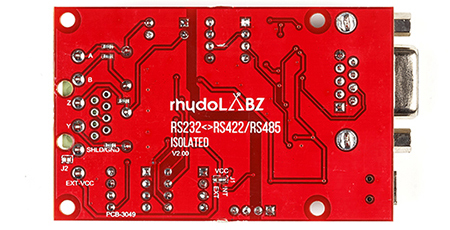 RS232 to RS485/RS422 board with isolation is a new product from rhydoLABZ . It is a simple and reliable solution for most standard commercial and industrial communications needs. It converts RS232 signals to half-duplex RS-485 signal and RS-422 full duplex signals. We can connect the board directly to RS232 port of PC via DB9 connector and select the communication mode using DIP switch on the board. Any cabled I/O can be subjected to electrical noise transients from various sources. These noise transients can cause damage to the transceiver and/or nearby sensitive circuitry if they are of sufficient magnitude and duration. To avoid these damage, an IC ISO3080 is inserted in our board to provide galvanic isolation and it also used to converts data to RS422/RS485 logic. These isolated devices can significantly increase protection and reduce the risk of damage to expensive control circuits. This board is manufactured with Automatic Pick and Place Machine for high quality standard. The shield itself is high quality PTH PCB with professionally designed circuitry. The J1 jumper allows you to select external power(5V) or USB power to be used. We have also considered optional customization as per users convenience, for which the design includes onboard PCB jumpers and DIP switches. Option for Manual and Automatic Transmitting and receiving data in RS485/RS422 modes. Onboard ISO3080 IC provides galvanic isolation and convert the data to RS485/RS422 communication standard. 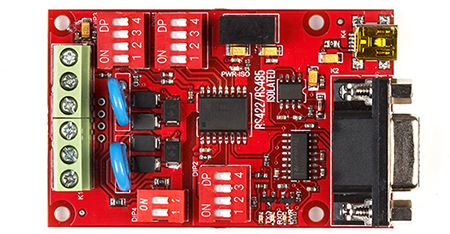 Onboard J1 jumper allows to select external power(5V) or internal power supply. Adjustable pull-up,pull-down and terminating resistor. Removable block terminal for bus connection. Indicator LED’s for Rx and Tx signal. Communication mode selected via DIP switch.